As much as I love the beauty of the Southwest, I don’t think I could do a desert for long. I need water. The ocean, a river, Lake Michigan…it all feels like possibility or hope to me. 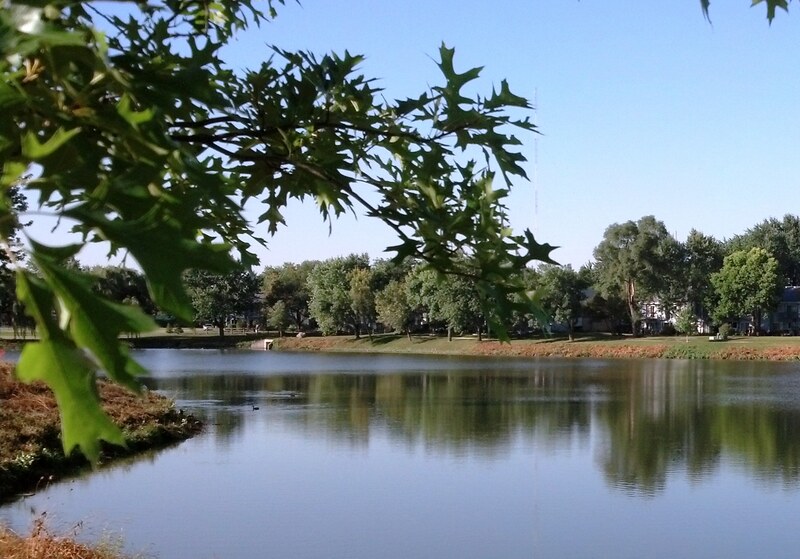 Even my little ol’ lake tucked away within my neighborhood. It’s just a small body of water, but for some reason, it always lifts my spirits. Every season around the lake offers its own take on life. Spring brings newness and the promise of summer. Summer is life in full bloom, where goldfinches swoop in for a nibble on a sunflower and swans that the village brings in to keep the geese away…swim with the geese. Autumn offers different blooms and colors that are at once invigorating and bittersweet, as I know that the flora is getting ready to tuck itself in for the winter. And winter…even though it can be harsh and cold, still has a beauty all its own. Some times are more beautiful than others around the lake, but there is no “bad” time. These days, it’s harder and harder for my head to clear, but my little lake helps me take a breath and free my mind up a bit from the fuzz of life. If I find myself using the time to think of all the things I need to do, I tell myself to shut up and listen instead. Listen and look for the beauty of the minute (mī-ˈnüt not ˈmi-nət, though I guess both meanings apply). Even though this little lake is smack-dab in suburbia and not in any majestic setting, there are still small wonders to enjoy. The occasional snapping turtle that takes a sun nap before continuing its journey back to the water. The herons dipping in for breakfast and a bath. 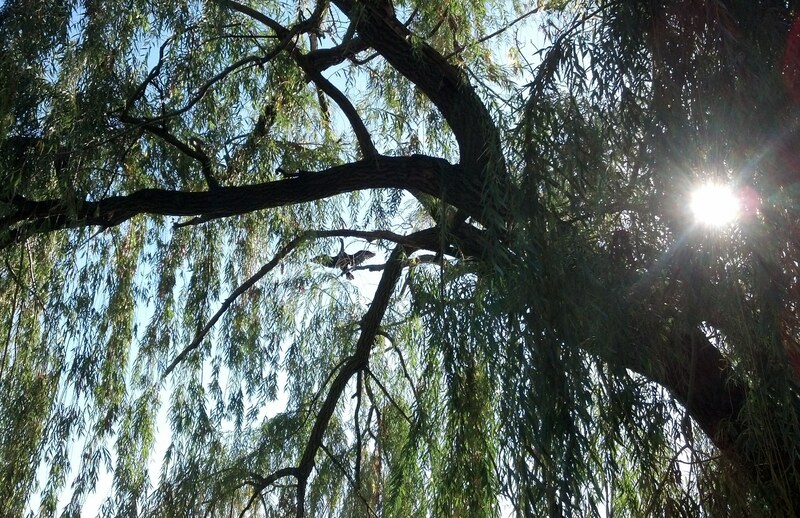 The huge willow tree blowing in the breeze. The shimmer of the sun tap dancing on the current. Simple beauty. Yep, I love my little lake. When my son was younger, there were times I would take him there for a visual scavenger hunt and make him find specific little gems, and I still enjoy going for a bike ride with him and seeing him notice something tiny and beautiful because he’s taking the time to do just that. I hope he always will. I don’t know what it is about water, but it’s good for the soul. At least it’s good for my soul. There is the beauty of it, but also the reminder that life is a symphony of sorts and all parts are important. I’m glad I have my own little lake to ripple away my cares—if just momentarily— and help me see the simpler side of things. Somehow it makes handling the more complex seem do-able. And that’s exactly what I need to start my week. Next Post What Have We Done? This is deep, but I always think our love for the serenity of water has something to do with how we spent the first nine months of our lives- in that wonderful amniotic fluid that protected us from the outside world. A peaceful, easy feeling. Floating on water whether in a boat, on a raft or on my back does it for me. I’m all for peaceful floating!